A gleam in the gloaming. In the dead of winter, the evenings are cold and dark and the mornings begin with a painfully slow return of the light. It’s as if the machinery that lifts the sun is a hand-cranked wooden device operated by an unnaturally decrepit wee person, whose tiny boots are lifted off the ground each time he reaches the top of the turn. On frosty mornings I can almost hear the creakings of the machine and the wee person’s bones. This makes the early light more precious, and I look to the east each morning to catch the first signs of illumination. During January I was usually halfway to work before they appeared. Maybe we have to endure the longer darkness of this season as a reminder of the importance of light and hope. Common wisdom in North Carolina is that it takes two bitterly cold months to annihilate all the fleas and ticks; perhaps it’s the same for people, and long spells of cold and dark eradicate some of our more toxic qualities and cause us to seek the light more purposefully. In a winter-hammered landscape, the light creates a feeling of compassion…it is possible to imagine a stifling ignorance falling away from us. – Barry Lopez, author of Arctic Dreams, as quoted by Robert Macfarlane in his wonderful book, Landscapes. Even during the gray weeks of Lent there are signs of hope. One Sunday morning this winter I glanced outside and saw a bright flash in the birdbath, like a bit of mirror reflecting the first fragments of sunlight, even while the rest of the landscape lay steeped in gloom. I stood at the back door in my pajamas, trying to figure out what the gleam meant. I looked at it through our binoculars, then Ernesto looked. Finally I put on socks and a jacket over my pajamas and went to check it out. It was ice. (“I told you,” E. said.) 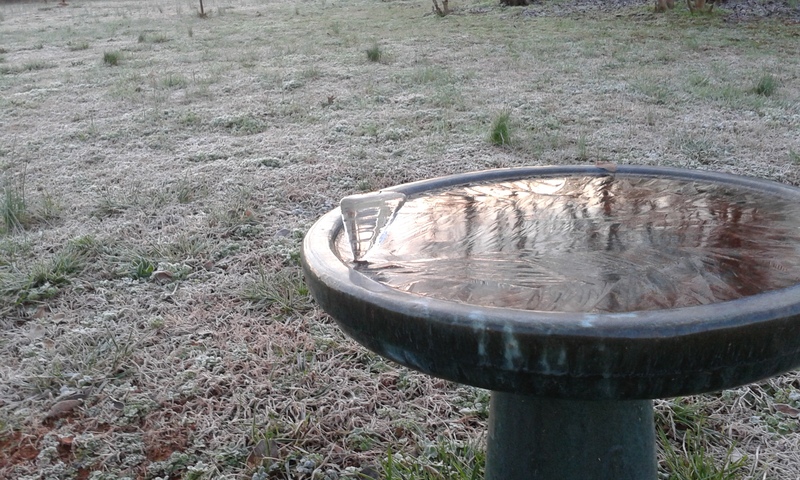 The ice had grown out of the birdbath to form an inverted pyramid, about 1.5” tall and filled with water. To my surprise, one night at about 11:00 PM I found the water in one bottle cap formed into what is called an Ice Spike. I had read about these but suddenly I had my own. I have been able to produce ice spikes on occasion but have not been able to do it consistently. 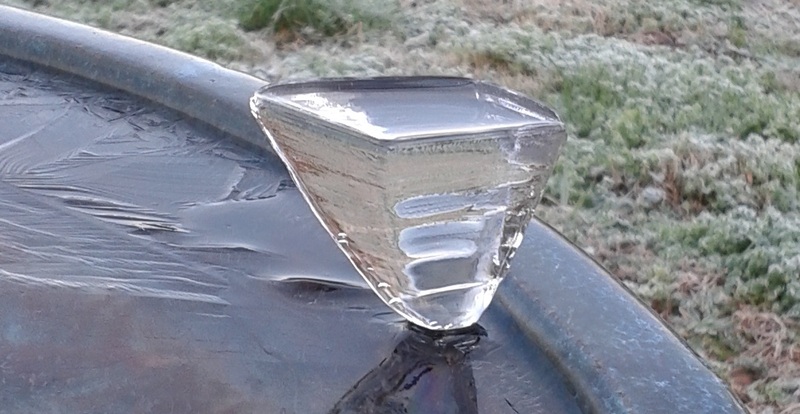 This triangular ice in the birdbath is not unique in the world. The Weatherwise explanation provides a link to a web page of a couple in Scotland where they show a number of such ice formations that they found in their garden. 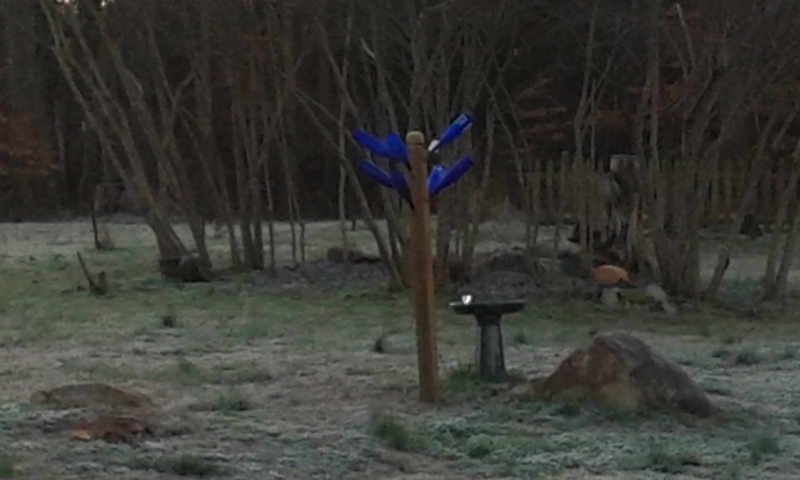 And I have received photos from other persons showing triangular wedges of ice growing in birdbaths. I appreciate seeing such photos so please share them with me. Well, of course I would share. I immediately sent an e-mail to Dr. Carter with a photo of our ice vase (that’s what Fred and Sarah, the couple in Scotland, call them). He wrote back straight away, telling me he’d never seen one with a four-sided top; they’re usually triangular. He added that he may post my photos to his website, but he made no firm promise, as he doesn’t update the pages very often. Ice vase, after I displaced some of the water inside by sticking my finger in it. Star-like or not, in the grand scheme of things our ice vase—which melted in the afternoon sun—is hardly important. 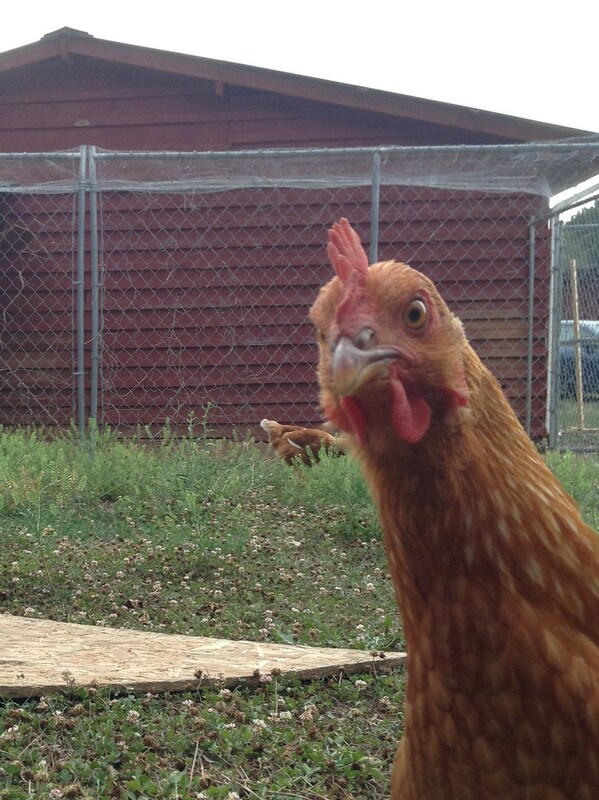 Maybe you’ve noticed there’s a lot going on in the world right now. In America alone, politicians have been taken over by a sort of lunacy, every symptom of which is reported with great zeal. Instead of falling away, a stifling ignorance seems to be closing in on us. Why isn’t the cold and dark creating a feeling of compassion in the political arena, or at least killing off the hateful fleas and ticks? No wonder I want only to turn away, and look for light on the horizon—which happily comes a wee bit earlier every morning and lingers a tad bit longer every evening. A writer should concern himself with whatever absorbs his fancy, stirs his heart, and unlimbers his typewriter. I feel no obligation to deal with politics. I do feel a responsibility to society because of going into print: a writer has the duty to be good, not lousy; true, not false; lively, not dull; accurate, not full of error. He should tend to lift people up, not lower them down. In ‘The Ring of Time,’ I wrote: ‘As a writing man, or secretary, I have always felt charged with the safekeeping of all unexpected items of worldly or unworldly enchantment, as though I might be held personally responsible if even a small one were to be lost. I have always felt that way, too. So I’m taking care to preserve evidence of our item of enchantment here, in my virtual cabinet of curiosities. Maybe a portion of the light that it held for one winter morning will be preserved with it, for the betterment of us all. Such a sweet gift—a piece of handmade writing, in an envelope that is not a bill…. – Garrison Keillor, “How to Write a Letter” from We Are Still Married, a passage included in The Book Lover’s Cookbook, by Shauna Kennedy Wenger and Janet Kay Jensen. 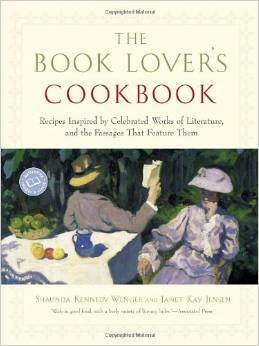 Two of my favorite things on earth are handmade writing and homemade cake, and the two collide in The Book Lover’s Cookbook. In the book, a passage from a piece of literature that describes a meal or a particular food is followed by a recipe for the featured dish. Sadly, the authors were unable to include some of my favorite literary foods, such as Marjorie Kinnan Rawlings and her homemade mango ice cream, or Gene Stratton Porter’s description of how Eudora’s mother fills her new lunchbox in A Girl of the Limberlost. I called my mom at 8:00 last night, and she reminded me that their church’s homecoming was today and asked didn’t we want to come. Ernesto said sure, so I decided I better go ahead and make the cake I had planned to make on Sunday afternoon. I already had the butter out to soften, so that was good. But I wanted to make a recipe that I had found in my grandmother’s old cookbook—one that she had written in by hand on a blank page of the Lizzie Sills Friends Cookbook. It was called Orange Slice Cake, and it included chopped dates and two cups of nuts. I had everything I needed, and thank goodness I bought the dates that were already chopped. But I had to chop the walnuts and the one pound of orange slice candy. That took forever. I also hit a snag with my hand mixer. I always keep the beaters for it in one particular kitchen drawer, and I could only find one last night. So I creamed the butter and sugar with one beater, and beat in the four eggs. It took longer to get full coverage of the bowl, plus, it looked ridiculous. That was actually nice, because while I was striving mightily to get everything beaten properly, I kept laughing at how silly my unbalanced, one-beater mixer looked. My grandmother had written “Bake at 325 for 3 hours.” Three hours!! I preheated the oven to 350, and then turned it down to 335 hoping that would help. It was 9:00 before the cake went into the oven, and I finally took it out at 10:45, well after Ernesto gave up on the project and went to bed. I let it rest for 10 minutes, then had a devil of a time getting it out of the Bundt pan. I was in despair, when I finally gave it one last, violent shake and yes! it popped out. I made a glaze of powdered sugar and orange juice and doused the hot cake, cleaned up the worst of the mess, and went to bed. The cake turned out okay, I think. I like it. It’s sort of like fruit cake but it wasn’t a true replica of Grandma’s cake, because I had used half the amount of dates that the recipe called for and didn’t have a full pound of orange slices because I had eaten about a quarter of them, and I left out the coconut because it didn’t seem necessary. Maybe I’ll begin a project to compile vintage recipes into a volume, with annotations. When I was thumbing through the Lizzie Sills cookbook this week, a page torn from the December 1992 North Carolina Farm Bureau News fell out. The headline reads “Try These Favorite Holiday Recipes.” There was a recipe for Honey Bun Cake that sounded easy and fabulous, but the information, as is so often the case with these passed-along recipes, is lacking. “Pour one half batter in greased long pan.” What exactly does “long pan” mean? I guess I could find out, assuming the woman who submitted the recipe is still among the living. The Farm Bureau included the full name and mailing address of each submitter, so I know that Honey Bun Cake came from a Mrs. Dupree in Willow Spring, NC. I bet she would be surprised to get a letter from me with a question about her cake recipe. I own a 1997-vintage church cookbook from a Baptist congregation in Louisville, Kentucky. Even though it is slightly more modern than Lizzie Sills and the Farm Bureau article, there are some mysteries in it, too. On page 45 is a recipe for Gorilla Crush, which involves milk, orange sherbet, orange juice, and a banana. There is a wonderful sandwich filling called Fake Shrimp Salad. The ingredients are one can of ground Spam, one grated onion, one grated carrot, and enough mayo to make the stuff spreadable. The instructions are simple: “Mix all together in mixer – delicious!” I am most interested, though, in the Upside Down Pecan Apple Pie. It sounds fabulous—you make a sort of streusel mix and put it in the bottom of a pie pan, then place the bottom crust on top of it. Next, add the apples, sugar, and spices, and crown it with a top crust. Then it gets tricky. The instructions read: “Fold edge of top crust under bottom crust.” The next step is: “Fold edge of top crust under bottom crust.” No matter how many times it is repeated, I don’t get it. Maybe if I had the multiple crusts in front of me I would understand how that works. After baking, you must keep the pie upright for 5 minutes, and then invert it onto a plate. I am going to try this pie, even if (as I suspect) I will end up with third-degree burns from hot syrup scalding my arms during the inversion process. Soufflés rise and cream whips only for the family and for guests you didn’t really want to invite anyway. 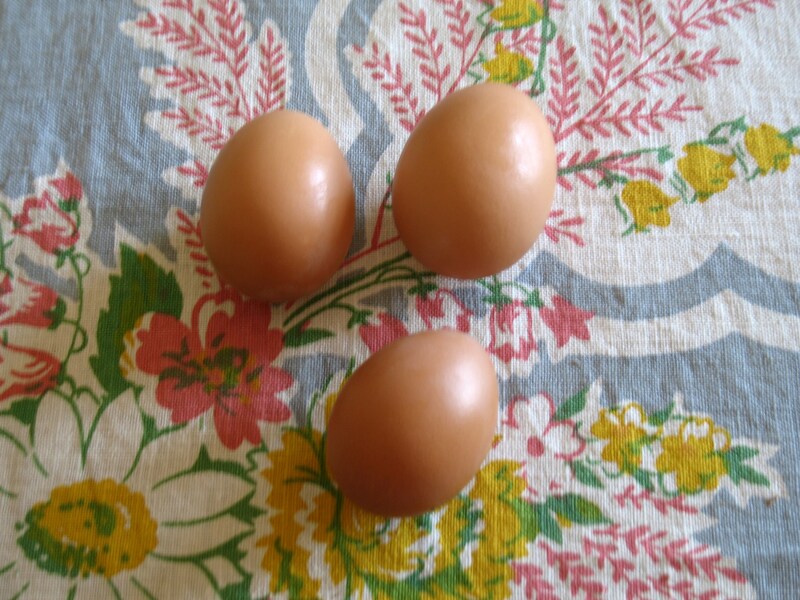 The rotten egg will be the one you break into the cake batter. Any cooking utensil placed in the dishwasher will be needed immediately thereafter for something else; any measuring utensil used for liquid ingredients will be needed immediately thereafter for dry ingredients. Time spent consuming a meal is in inverse proportion to time spent preparing it. Whatever it is, someone will have had it for lunch. If there is no happy ending … make one out of cookie dough.